The theme of technology is present throughout Active Comics No. 10, published in November, 1943 in Canada. The stories, in genres including science fiction, war, and adventure, feature repeated instances of transportation technology gone awry; two stories separately depict train wrecks. In “Active Jim”, Canadian boy Jim and his friend Joan encounter a Nazi character who attempts to derail a troop train. Through quick thinking and action, they are able to save the train from its fate, and apprehend the Nazi. 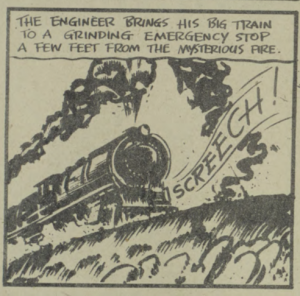 The “Thunderfist” story features a train which is nearly derailed by a mountain slide, but is saved from its fate by the title character. Edmond Good. Panel from “Active Jim”. Active Comics, No. 10, November 1943, Commercial Signs of Canada, p. 38. Bell Feature Collection, Library and Archives Canada. Murray Karn. Panel from “Thunderfist”. Active Comics, No. 10, November 1943, Commercial Signs of Canada, p. 48. Bell Feature Collection, Library and Archives Canada. Both stories approach the subject of the train wreck differently, one as an intentional sabotage, and the other as an accidental disaster. Both stories resolve with no actual carnage, but the presence of trains in danger poses the question: what led to this subject matter being presented in a comic book intended for children, and were these depictions of disaster influenced by World War Two (WWII)? In examining historical documentation, and the public reaction to train disasters, we are able to apply a philosophical lens to understand the social-historical context and pro-conflict propagandistic roots of the seemingly innocent entertainment imagery. The railway has played an important role in Canadian history. As a sprawling, disconnected country in the 19th century, the Intercolonial Railway was initially constructed to fulfill the government of Canada’s 1867 constitutional commitment to connect central Canada to the Maritime provinces (Cruikshank). Routes were selected to protect the railway from American attack, indicating an awareness for potential foreign hostility. During the completion of the railway between 1876 and 1914 there was a tenfold increase in freight and passenger traffic (Cruikshank). The railway was eventually incorporated into Canadian National Railways, continuing to fill the role of connecting the eastern and western ends of Canada (Regehr). 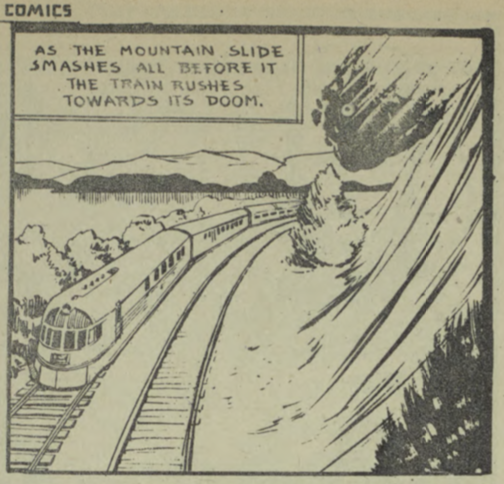 To find trains represented in a Canadian comic book is unsurprising, considering the significance of the train in Canadian culture. It is interesting, however, that these trains are presented in scenarios of danger. The railway has been connected to accidental death since its invention. An early major casualty was William Huskisson, a Liverpool MP, who in 1830 was run over and killed by the Rocket locomotive during the opening of the Liverpool and Manchester Railway (Odden 30). On a broader scale, the Angola Horror is an example of an early American train wreck that had a significant social impact. On December 18, 1867, a damaged track caused the last two cars of Cleveland’s lakeshore express to derail on a high bridge, falling into the gorge below. One car, lit with oil lamps and heated with coal ovens, burst into flames upon impact, resulting in the deaths of nearly 50 passengers trapped inside (Vogel). Mechanical accidents of this scale were unheard of prior to the invention of the train (Odden 31). Agricultural or carriage accidents were less impactful. The industrial revolution was underway, but while factory accidents could only injure workers, train accidents endangered consumers, making no distinctions between class. The Angola Horror was reported in newspapers for weeks, accompanied by graphic illustrations. The American public demanded improved railway safety, resulting in the invention of the air brake, which was made mandatory on American trains in 1893 as a means of stopping trains in an emergency (Vogel). The train was vital to the war effort, but they were not without failure. An example of a Canadian train wreck contemporary to WWII occurred in December 1942. A “troop special” carrying soldiers from Pettawa military camp collided with a local train full of holiday travellers at Almonte station near Ottawa. 32 were killed and 114 injured, and the town was thrown into confusion and panic (32 DIE, 114 HURT IN TRAIN WRECK 1). These accidents were not common (Björnstig and Forsberg 368), but had major impacts on the involved community when they did occur. During the war overseas, however, train wrecks were often not accidental. A 1944 example was published in the Globe and Mail article “U.S. Tanks Blast Trains, Huns Burn in Perfume”, a graphic account of a “train bust”, or targeted attack on an enemy train. This particular German train carried personnel and “every kind of equipment”, as well as liquor and perfume (Denny). In fact, trains were one of the most important modes of transportation during the war, transporting 90 percent of all military hardware and 97 percent of all troops in America alone. In 1943, the year Active Comics No. 10 was published, trains took 10 million troops off to war; these contributions were vital to the war effort (Keefe). This also meant that to gain control of an enemy train, or to destroy it, was an effective way to damage enemy resources. Train busters were commended for their efforts. An example is John A. Gordon, who was awarded the Distinguished Flying Cross in 1946 for destroying 20 locomotives and 64 other vehicles while stationed in the Mediterranean (“‘Train Buster’ Awarded DFC”). Edmond Good. Page from “Active Jim”. Active Comics, No. 10, November 1943, Commercial Signs of Canada, p. 36. Bell Feature Collection, Library and Archives Canada. The “Active Jim” story in Active Comics is directly inspired by these train busts, but it depicts a Nazi train buster operating in Canada, a scenario with no basis in reality, as these were primarily European occurrences. 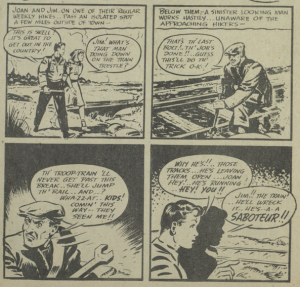 In the final panel of the comic the train conductor character breaks the fourth wall, telling readers, “The Nazis tried to wreck our train, to kill our fighting boys… Jim and Joan’s quick action foiled their murderous scheme.. It was close!.. But they’ll never beat people with courage! Keep it up Active Jim!” (Kulbach et al. 38). Jim is presented as a character to emulate, and here is commended for being active in the war effort, a stance that is ultimately pro-conflict. However, the comic presents a sanitized, child-friendly interpretation of a train bust, resolving with no death or destruction. French philosopher Paul Virilio speaks of “the accident” as a consequence of advancing technology; according to Virilio, “The accident is … the hidden face of technical progress” (Redhead 10). For example, prior to the invention of the train, the “train accident” was not a possibility. As soon as this technology was invented, however, it brought with it the capacity for failure, and the train accidents of the 19th century were at a level of severity and violence that had never occurred before. Virilio discusses a “society of spectacle”, referencing the media’s approach to accidents as “…the ravages wrought by the circulation of images, this constant concertina-ing, this constant pile-up of dramatic scenes from everyday life on the evening news.” (Virilio). Accidents have always been reported, and there is often an element of sensationalism attached to them. This has changed the nature of the accident in terms of scale, moving away from a localized event towards a potential for the “global accident” (Redhead 11); Virilio cited the 9/11 attacks as having occurred everywhere at once through live airing on television (Redhead 13). Virilio’s theories hold true to the historical data related to train wrecks. One comprehensive review published in the Prehospital and Disaster Medicine journal examined data of 529 railway disasters over the course of a century, beginning in 1910. The study determined that the number of railway disasters has increased over the years, being relatively infrequent during 1910-1949, but with 88% of disasters studied occurring post-1970 (Björnstig and Forsberg 368). This was attributed to increased speeds and traffic on railways. Train wrecks have always inspired public imagination and horror, reported widely in the news media. According to Virilio, the press has more interest in trains that are derailed than trains that are on time, and these interests are echoed in entertainment media as well. The dynamic that Virilio describes between “the accident” and “the attack” is represented recurrently throughout history and entertainment media. The two stories in Active Comics are a prime example, being presented in the same medium, publication, and in a similar artistic style, placing the “accident” of Thunderfist’s mountain slide and the “attack” by the Nazi on an even field. Although Virilio writes about television media as a force of momentum in manufacturing public interest in accidents, this interest can be traced back long before the invention of the television. When researching historical disasters, one will often find accompanying dramatic illustrations produced during the period. One major producer of such imagery was Currier and Ives, 19th century lithograph artists. Lithography was a fast and cheap method of mass image production (Encyclopedia of World Biography 346). In 1840, Currier and Ives produced a current-events inspired lithograph of fire breaking out aboard the steamship Lexington. The sales motivated them to create more images of current-event disasters (Le Beau 21). The American public of the mid-19th century wanted visual representation of what they read in the newspapers, and so these prints remained popular. The Angola Horror, Frank Leslie’s Weekly, 1867. Wikimedia Commons. Public Domain. The Angola Horror is an example of this phenomenon, being depicted through “grisly illustrations” in the newspapers (Vogel). 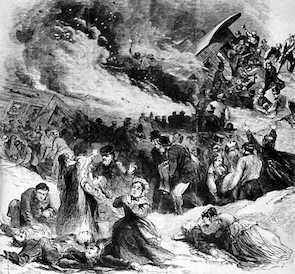 The image to the left was published in Frank Leslie’s Weekly, showing mourners amongst dead bodies while the train burns in the background. Willy Stöwer. Der Untergang der Titanic. Engraving. Die Gartenlaube, 1912. Wikimedia Commons. Public Domain. The Titanic disaster is a more famous example. 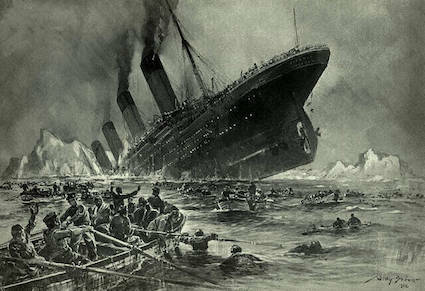 As the 1912 sinking was reported in newspapers, the public wanted visuals, and the press commissioned artworks of varying quality for use in their publications (Historical Telegrams 19:45 – 20:30). These images followed in the tradition of presenting the scene dramatically, such as this engraving by Willy Stöwer showing survivors observing the disaster from the lifeboats. 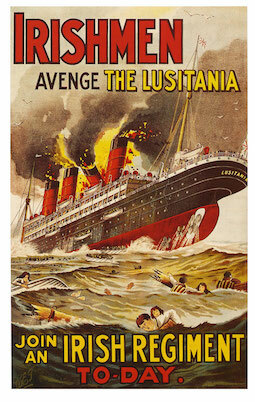 The RMS Lusitania was another ill-fated ship. During WWI on May 7, 1915, the passenger liner was sailing through an area south of Ireland that Germany had declared a war zone, when it was torpedoed by a German submarine, sinking in 18 minutes and killing 1198 people (Feldman 12). Aside from presenting a further example of technology enabling more dire disasters, the aftermath provides insight into the power of disaster imagery. The attack of a liner filled with civilians was obviously a controversial act, and in the U.S. this was heightened by the loss of many American civilians that had been on board. 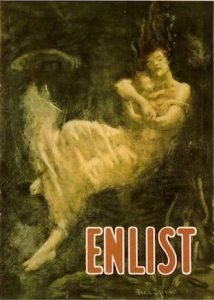 Cartoonists’ subsequent illustrations depicted ghosts of women and children haunting the Kaiser, and images of Uncle Sam shaking his fist at Germany (Feldman 14), and posters encouraged enlistment. By 1916, the event had become a “rallying cry for the Preparedness Movement”, a campaign for military enforcement (Feldman 15). In April of 1917, America entered the war, affecting the course of history (Feldman 16). Fred Spear. Enlist. Wikimedia Commons. Boston Committee of Public Safety, 1915. Public Domain. This disaster imagery has a profound social impact, effecting change in safety protocol, or even influencing a country’s participation in war in the case of these recruitment posters. This culture of disaster imagery presented as entertainment is also an influence on other forms of visual media, including stories of publications such as Active Comics. The train wrecks depicted in Active Comics No. 10 demonstrate a binary dynamic between an “attack” and an “accident”. In keeping with Virilio’s theories, the comic depicts both scenarios on an even field, limiting our ability to distinguish between the two. This preoccupation with disasters is the result of decades of media influence, and a culture of “disaster imagery” being produced for the purposes of entertainment. Imagery with war themes serves a propagandistic social function, influencing historical pathways. In Active Comics No. 10, this imagery reinforces a moral message toward the primary audience, children, demonstrating clearly who the enemy is, and how to approach conflict scenarios correctly. The comic also brings concepts of overseas wartime events closer to home, an environment where there is already the potential for deadly accidents, mirroring those that occur through the war. Ultimately, while train wrecks throughout history have brought carnage, violence, and death, Active Comics No. 10 takes an optimistic approach, portraying heroes as capable of saving the day. These representations may have been sanitized for consumption by children, but there remains a dark and powerful history behind these forms of imagery. “32 DIE, 114 HURT IN TRAIN WRECK: Troop Special Plows Into Local at Almonte Rear Car, Filled With Holiday Travellers, Is Crushed; Dead Said to Be in Civilian Coaches; City Hall Turned Into Emergency Aid Station.” The Globe and Mail (1936-Current), 28 Dec. 1942, pp. 1–2. Björnstig, Ulf and Forsberg, Rebecca. “One Hundred Years of Railway Disasters and Recent Trends.” Prehospital and Disaster Medicine, vol. 26, no. 5, Oct. 2011, pp. 367–373. http://dx.doi.org.ezproxy.lib.ryerson.ca/10.1017/S1049023X1100639X. Accessed Nov 23. 2018. Cruikshank, Ken. “Intercolonial Railway.” The Oxford Companion to Canadian History, Oxford University Press, 2004. http://www.oxfordreference.com/view/10.1093/acref/9780195415599.001.0001/acref-9780195415599-e-795. Accessed 23 Nov 2018. “Currier and Ives.” Encyclopedia of World Biography, 2nd ed., vol. 4, Gale, 2004, pp. 345-346. http://link.galegroup.com/apps/doc/CX3404701609/GVRL?u=rpu_main&sid=GVRL&xid=cf9e9ad9. Accessed 23 Nov 2018. Denny, Harold. “U.S. Tanks Blast Train, Huns Burn in Perfume.” The Globe and Mail, 1 Sept. 1944. Feldman, Seth. “Winsor McCay’s The Sinking of the Lusitania and the Origins of Animated Documentary.” Cineaction, no. 97, 2016, pp. 12-22. http://search.proquest.com/docview/1770825511/citation/97A03ABD73694664PQ/1. Accessed 23 Nov 2018. “Historical Telegrams Ep. 2: The Artistic History of the Titanic” Youtube, uploaded by Titanic: Honor and Glory, 24 Sep. 2018, https://www.youtube.com/watch?v=LbKXjbLWGAg. Accessed 23 Nov 2018. Keefe, Kevin P. “Riding the Rails: Michigan’s Super-Power Steam Locomotives.” Michigan History Magazine, vol. 100, no. 6, 2016, pp. 17+. http://link.galegroup.com/apps/doc/A492464099/AONE?u=rpu_main&sid=AONE&xid=c6b91cb8. Accessed 23 Nov 2018. Kulbach, René, et al. Active Comics: No. 10. Bell Features and Publishing Company Limited, 1943. http://data2.collectionscanada.gc.ca/e/e447/e011166511.pdf. Accessed 23 Nov 2018. Le Beau, Bryan F. “Art in the Parlor: Consumer Culture and Currier and Ives: Art in the Parlor.” The Journal of American Culture, vol. 30, no. 1, Feb. 2007, pp. 18–37. 10.1111/j.1542-734X.2007.00462.x. Accessed 23 Nov 2018. “Munitions Train Blast in Hungary Wrecks Main Line.” Hamilton Spectator, 8 Jan. 1941. https://collections.museedelhistoire.ca/warclip/objects/common/webmedia.php?irn=5091654. Accessed 23 Nov 2018. Redhead, Steve. “The Art of the Accident: Paul Virilio and Accelerated Modernity.” Fast Capitalism. https://www.academia.edu/301450/The_Art_of_the_Accident_Paul_Virilio_and_Accelerated_Modernity. Accessed 23 Nov 2018. Regehr, T. D. “Canadian National Railways.” The Oxford Companion to Canadian History, Oxford University Press, 2004. http://www.oxfordreference.com/view/10.1093/acref/9780195415599.001.0001/acref-9780195415599-e-274. Accessed 23 Nov 2018. “‘Train Buster’ Awarded DFC.” Globe and Mail, 18 Feb. 1946. Virilio, Paul. “The Museum of Accidents.” International Journal of Baudrillard Studies, translated by Chris Turner, vol. 3, no. 2, July 2006. https://www2.ubishops.ca/baudrillardstudies/vol3_2/virilio.htm. Accessed 23 Nov 2018. Vogel, Charity. “The Angola Horror: A Deadly Train Wreck 140 Years Ago Brought Tragedy to a Western New York Village–and Gave John D. Rockefeller Reason to Be Thankful.” American History, 1 Feb. 2008. http://link.galegroup.com/apps/doc/A212275938/AONE?sid=googlescholar. Accessed 23 Nov 2018.